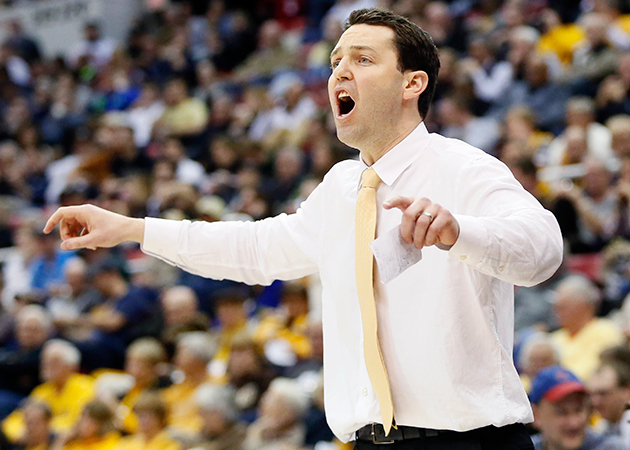 New Vanderbilt coach Bryce Drew discusses his transition from Valparaiso, recruiting and his long-term plan for the Commodores. With the 2016 college basketball coaching carousel nearing its conclusion, SI.com is checking in with all the major hires about their new gigs. These Q&As will be posted periodically throughout April, May and June. Next up is Bryce Drew, who spent five seasons as Valparaiso’s head coach before leaving for the same post at Vanderbilt. Drew, 41, led the Crusaders to a 124-49 record, a winning percentage of 71.7%, four Horizon League regular-season championships, two conference tournament titles and two trips to the NCAA tournament. Sports Illustrated: You’ve been at Valpo for more than a decade. What was the thing that finally changed and moved you from there? Bryce Drew: I think Vanderbilt is a unique place, where you get one of the best academic schools in the country, and yet you get to compete in one of the most competitive conferences in America. And then when you throw in the city of Nashville, one of the quickest-growing cities in the country, there were so many positives to being here. SI: Does it remind you of your NBA days? You played for three teams in six years. Are you having flashbacks to moving around? BD: You know, I am. It’s kind of funny you ask that, but definitely. When you sign with a team, you know you’re moving to a new area. I did that quite a few times during that period. And my wife and I have been stationary for quite a while in Valpo. The great thing is that now I get to take my wife and my little boy with me. Before I was going alone. SI: You know how after a guy hits a major shot, they say he’ll never buy lunch again. Well you hit the shot. I’m curious how long the free lunches last—or if they ever come. BD: (Laughs.) You know they didn’t really ever come in. In Valpo, I knew everyone so well, and they made me pay. But that whole moment there was such a blessing. For them to still show the highlight now is pretty special to me and my family and the school. SI: I think it would take a few more Kris Jenkins-type shots to move you off the reel. BD: Well I love last-second shots, but you’re right: Hopefully we never get taken off the reel. SI: Is there something nice about going somewhere to forge your own identity? ​BD: You know I haven’t really gotten into replacing anyone. When I took over for my dad, it was a different time and a different era, and I had different aspirations. And in coming to replace coach [Kevin] Stallings, who had been tremendous here for 17 years, I just kind of view it as a new era. And every era is a new era. College basketball changes, and I just want to focus on doing the best job I can and not trying to compare myself to previous coaches, whether at Valpo or Vanderbilt. SI: When you’re looking for advice, do you call your dad or your brothers—who is the first person you dial? BD: It’s definitely my immediate family. My brother and dad have been in the profession for a while and have seen a lot of things, so I’ll get there input. But it was something that my wife and I prayed about, and we went through a lot of different scenarios that could play out, we felt excited about the opportunity. SI: When it came open, did it catch your eye right away? ​BD: We were playing in the NIT still. I had told my wife that I would focus on our team through the end of our season. I owed it to those guys, and I wanted to give it my best. So I put off all that stuff. But it was a blessing that we made the NIT finals, because I don’t think Vanderbilt opened until right before we went to New York for the NIT semifinals. It all happened pretty quickly after that, but again, it wasn’t something we worried about until after the season was completely done. SI: It’s a big conference transition for you. But I feel like the SEC is in a transition right now with new coaches at Florida, Mississippi State, Alabama, among others. As you look out at the league, do you see a league in transition? BD: Obviously, those are all incredible coaches with impeccable résumés that you listed. I believe the SEC is on the rise and especially with those coaches. Programs are going to be successful here. I saw it as a challenge to be able to compete against some of the best coaches in America. SI: You’ve been out there recruiting against those coaches now. What are the initial returns as you’ve been out representing Vanderbilt? BD: You know, recruiting is recruiting. It’s about building relationships and finding that right fit for your university. We’ll have the same approach with that. Vanderbilt is a name that’s recognized nationally. At Valpo, we pinpointed certain areas where we wanted to recruit. At Vanderbilt, it’ll be much broader. We’ll recruit nationally and also internationally. Our lists will probably be a lot longer than they were at Vanderbilt. SI: I’m interested in the idea of going from a one-bid league to a multi-bid league. The Horizon League tournament cost you this year. How much does that affect the decision to go to a bigger conference? BD: It was frustrating in the end that our team didn’t get in the NCAA tournament. We had a lot of quality wins, and on paper our resume was very, very good. And we had one of our key players injured. SI: It was a bad year to be a mid-major, in general, with Monmouth and St. Bonaventure being left out too. BD: Yeah, and we put ourselves in a good position but then lost in the semifinals of the [Horizon League tournament]. It was frustrating. It obviously wasn’t the determining factor by any means. But that was the best team we’d had in five years, and I felt like we were built to make a run in the NCAA tournament—but we had one bad night after being sensational all season along. From that end, it was frustrating. SI: As you get to know the roster, do you have a method of how you introduce yourselves to the players? BD: Well, first I just try to get to know them and why they chose Vanderbilt, and what type of system they think they would be successful in. The first part is getting to know the players and hearing them talk vs. hearing me talk. We’ve had some great meetings, and there are sensational student-athletes here. We’ve had some really positive conversations about them and about our future. SI: You haven’t convinced Wade [Baldwin IV] not to sign with an agent yet, have you? ​BD: (Laughs.) Well that’s already done. So we are cheering for him and Damian [Jones] to be first-round picks. And we’ll look forward to having them back here in the summers. SI: This is looking ahead, but how do you find the line between instilling your system and adjusting to what the returning players are accustomed to? BD: We’ll do a lot of the evaluation this summer. We’ll look at their games last year, and we’ll work them out in the summer. And hopefully going into the fall, that’ll give us a good indication of how we’ll go with the current roster. Obviously, they were successful last year and made the NCAA tournament. So this summer we’ll look and see what things we can implement and what we can add with new players coming in. SI: One of my favorite things about Vanderbilt is that they’re one of three teams to have made a three-pointer in every game since the line was introduced. I’ve seen you ditch the suit jacket many times when a player passes on an open three. Safe to say the streak is going to stay alive? SI: At your opening press conference, your big statement was that you wanted to take Vanderbilt to its first Final Four. That doesn’t happen overnight. What’s your long-term plan? BD: I love the potential at Vanderbilt. You can see the strides that the whole athletic department has made in the last 10 years. And again, Nashville is one of the best growing cities in the U.S. There are a lot of things going on that are great here. And so we feel it’s a great time to be here. Obviously, our goal is adding a few pieces to our already good roster, putting in our system, and hopefully having some breakthroughs in March.